Discover the underlying proteins and PTMs differentially regulated in your samples today with the turnkey solution Protalizer DDA. This tool is a perfect solution for any label-free DDA application ranging from therapeutic antibody characterization, protein-protein interaction (PPI) studies, and large-scale total lysate quantitative proteomics. Obtaining correct identification and quantification results requires correcting observed m/z values to the most accurate values possible. Protalizer DDA does this by applying an m/z dependent calibration on all precursor and fragment ion m/z values in each file based on observed errors in each 25 m/z range. Calibrated peak data is then researched at a fixed FDR rate based on a target-decoy search. ​ProtalizerTM DDA reduces m/z error by 4-fold. 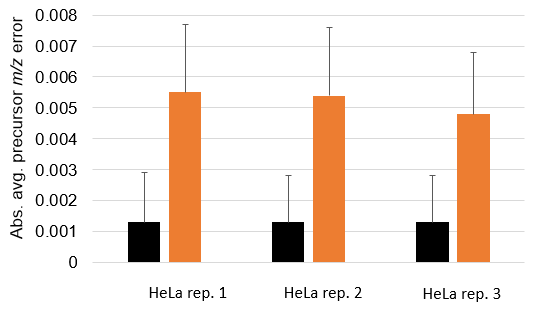 Data on the right shows HeLa tryptic digests analyzed on a Bruker Impact II QTOF with a 90 minute reversed-phase gradient searched against the human Swiss-Prot database with and without applying m/z calibration. The raw data were downloaded from ProteomeXchange accession number PXD001592. Peptides identified in each sample are matched to MS1 chromatograms. Then to avoid missing quantitative data, peptides not identified in each sample are searched for with normalized retention times based on the retention time drift of MS1 chromatograms of common peptides detected in multiple samples. Due to the variation of DDA methods in different laboratories, the software allows users to adjust various settings in the MS1 chromatogram extraction algorithm to obtain the best results with any dataset (e.g., the minimum number of consecutive MS1 scans a peptide precursor must be detected, etc.). Monitoring the efficacy of these changes is facilitated by Quality metric #7 reported by the program that shows the percentage of identified peptides that were able to be matched to chromatograms. A major problem verifying differences by visual inspection in large-scale studies are that thousands of proteins are often quantified resulting in large numbers of differentially regulated proteins across the sample conditions compared. 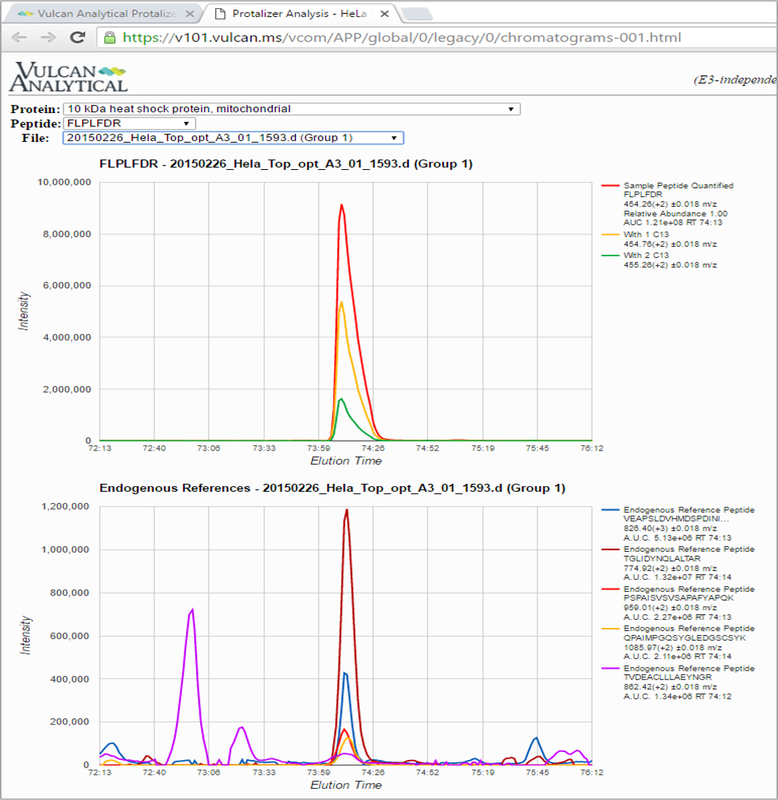 To solve this issue, ProtalizerTM DDA generates chromatogram archives of every peptide compared across samples. These digital chromatograms reduce the time needed to verify findings compared to other visualization tools, are created in HTML to promote use by non-proteomic specialists, and allow querying all the peptides for a specific protein of interest by protein name rather than through numerous mass-to-charge ratio inquiries. Furthermore, to address technical artifacts caused by ion suppression and instrument performance variability, the chromatograms include a co-eluting (or closely-eluting) ‘endogenous reference peptide’ as a quantification quality control for each peptide quantified. 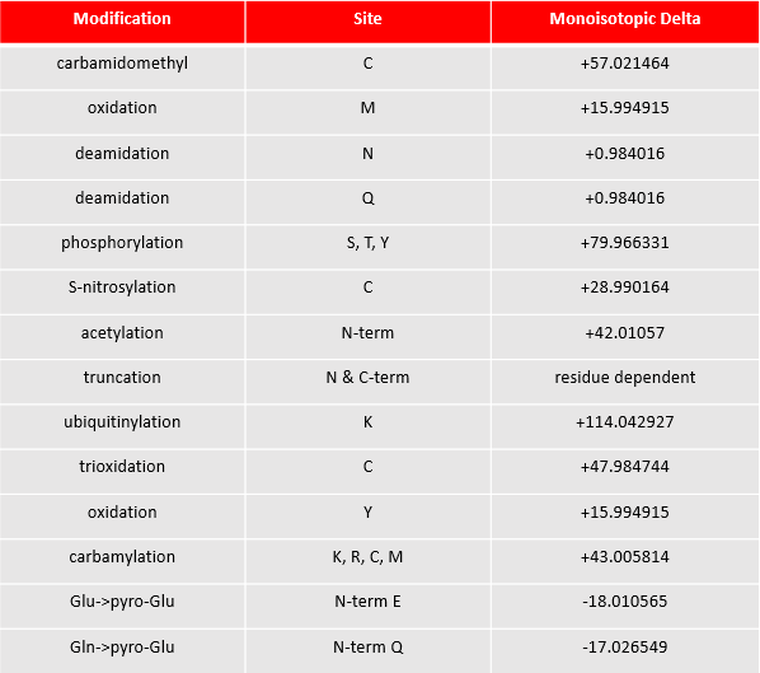 These references are selected based on having the most consistent concentration across the samples analyzed, and provide retention time-specific intensity normalization that reduces the peptide coefficient of variation. Protalizer DDA rapid MS1 XIC quantification view. Top panel shows a peptide quantified from 10 kDa heat shock protein, FLPLFDR with the monoisotopic, 1C13, and 2C13 traces and the bottom panel shows the monoisotopic traces only for five co-eluting endogenous reference peptides. "The quantitative protein differences reported by the software were able to be validated."